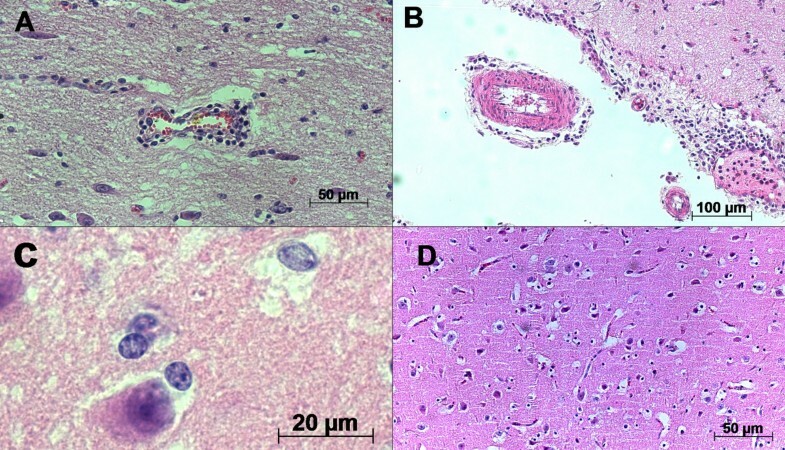 Meningoencephalitis by Herpesvirus type 5 (BoHV-5) in cattle has some features that are similar to those of herpetic encephalitis in humans and other animal species. Human Herpesvirus 3 (commonly known as Varicella-zoster virus 1), herpes simplex viruses (HSV), and equid Herpesvirus 1 (EHV-1) induce an intense inflammatory, vascular and cellular response. In spite of the many reports describing the histological lesions associated with natural and experimental infections, the immunopathological mechanisms for the development of neurological disorder have not been established. A total of twenty calf brains were selected from the Veterinary School, University of São Paulo State, Araçatuba, Brazil, after confirmation of BoHV-5 infection by virus isolation as well as by a molecular approach. The first part of the study characterized the microscopic lesions associated with the brain areas in the central nervous system (CNS) that tested positive in a viral US9 gene hybridization assay. The frontal cortex (Fc), parietal cortex (Pc), thalamus (T) and mesencephalon (M) were studied. Secondly, distinct pathogenesis mechanisms that take place in acute cases were investigated by an immunohistochemistry assay. This study found the frontal cortex to be the main region where intense oxidative stress phenomena (AOP-1) and synaptic protein expression (SNAP-25) were closely related to inflammatory cuffs, satellitosis and gliosis, which represent the most frequently observed neurological lesions. Moreover, MMP-9 expression was shown to be localized in the leptomeninges, in the parenchyma and around mononuclear infiltrates (p < 0.0001). These data open a new perspective in understanding the role of the AOP-1, MMP-9 and SNAP-25 proteins in mediating BoHV-5 pathogenesis and the strategies of host-virus interaction in order to invade de CNS. Bovine Herpesvirus type 5 (BoHV-5) is member of the family Herpesviridae, sub-family Alphaherpesvirinae, and is the primary etiological agent of non-suppurative meningoencephalitis, which is described as a cause of significant economic losses to beef cattle in Latin America . Outbreaks of BoHV-5-associated encephalitis have been reported worldwide; however, most positive cases are located in South America [2, 3]. In addition, a marked neurotropism that frequently leads to fatal disease has been shown to be caused by BoHV-5, and the olfactory bulb and frontal cortex have been described as sources of virus replication [4–6]. Lesions related to central nervous system (CNS) infection have been well-described in cattle , rabbits , sheep  and goats , mainly with regard to neuronal degeneration and inflammatory response. The distribution of BoHV-5 DNA during the acute and latent phases of infection in experimentally infected rabbits and calves has been determined by amplification of glycoprotein C gene using the polymerase chain reaction (PCR) from brain suspensions . However, to improve the in situ detection of viral genes, an in situ PCR protocol was established and used to implicate the olfactory bulb of the infected bovine CSN as the target region in natural cases of BoHV-5 infections . Most of the neuro-pathological patterns have been established to characterize the microscopic lesions . In addition, these patterns are controversial due to the difficulty in isolating BoHV-5 from the respective cases and also the different stages of the disease: acute infection, latency and re-activation of virus infection [5, 10]. Metalloproteinases (MMPs) are zinc-dependent proteases that are secreted by most cell types as proenzymes. MMPs are classified in terms of their substrate specificity into classes such as gelatinases, collagenases and stromeolysins . MMPs play key roles in inflammatory responses through protease-release of cell membrane-bound factors and activation or inactivation of cytokines, chemokines and growth factors. MMP-9 is known to digest gelatins and types III, IV and V collagen . Moreover, findings support a central role of MMP-9 in T-cell migration and in disruption of vascular basement membranes, and this protein has recently been shown to act directly in the blood-brain barrier after virus infection [12, 13]. Mitochondria play an important role in the aerobic energy metabolism of living cells. The mitochondrial electron transport system consumes approximately 85% of the oxygen utilized by the cell, and about 5% of the oxygen is converted to reactive oxygen species (ROS). In the normal state of the cell, the adequate concentration of ROS participates in a wide variety of cellular functions, including cell proliferation, differentiation and apoptosis . However, the significant induction of ROS or the depletion of cellular antioxidants induces cell death, and ROS are likely to act as signaling intermediates that are involved in the signal transduction mechanism for apoptosis. The anti-oxidant protein 1 (AOP-1) is an antioxidant protein and functions as a thioredoxin-dependent peroxidase, which scavenges ROS such as H2O2. Little information about cellular signaling and its possible participation in the pathogenesis of BoHV-5 infection in calves with neurological disorder is available. Also, other mechanisms that can trigger CSN damage must better established. To this end, we aimed to further investigate the BoHV-5-induced brain lesions associated with some pathogenic events, such as the expression of anti-oxidant protein 1 (AOP-1) and synaptosome-associated protein (SNAP-25) as well as the status of blood-brain barrier integrity (MMP-9) among 20 cattle brains. Secondly, the histological lesions were directly compared with the results of immunolabeling in the frontal cortex, parietal cortex, thalamus and mesencephalon. For the present study, 20 cattle brains diagnosed as negative for rabies virus and positive for BoHV-5 were used . 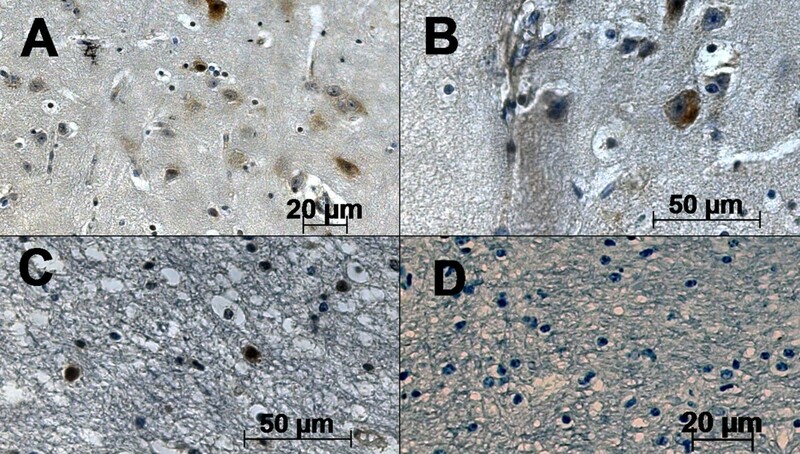 These brains were obtained from routine necropsy at the veterinary school of the University of São Paulo State from 2004 to 2008 and had previously been confirmed as positive for BoHV-5 infection after virus isolation in the Madin-Darby bovine kidney (MDBK) cell culture system and molecular analysis . The cases studied had shown different clinical signs at the ante-mortem inspection, as described previously . The whole brain was sampled and dissected into four brain areas: the parietal cortex (Pc), frontal cortex (Fc), thalamus (T) and mesencephalon (M). Both hemispheres were analyzed in this study. The sections were immersed in 10% phosphate-buffered formalin, sectioned into 10- to 15-mm thick sections, blocked and immersed in 98% formic acid for 24 h and then embedded in paraffin wax. Sections (4-μm in thickness) were then obtained for routine Haematoxylin and Eosin (HE) staining, and the respective microscopic lesions were characterized at least by two different pathologists blind to the experimental design. In order to access the cross-reactive of antibodies, 25 BoHV-5 negative brain samples were used in this study for all analysis described followed. To perform the IHC assay, a standard avidin-biotin-peroxidase complex (LSAB kit, Dako, CA, USA; code K0690-1) method was used as described previously . Unstained sections (4-μm) were deparaffinized, rehydrated and washed in buffered saline with 0.1% Tween 80. The first step was to microwave the sections in citrate buffer (pH 6.1) for 15 min at 700 W to retrieve the viral antigen, which is normally damaged by formaldehyde fixation. Just before staining, the slides were treated three times with 2% (v/v) of hydrogen peroxide 30 vol diluted in 50% (v/v) methanol and deionized water for 30 min to inactivate the endogenous peroxidase. The slides were then washed 5 times for 10 min each wash in buffered saline to remove residues. The next step was to block nonspecific binding by incubating in 15% reconstituted dry nonfat milk for 90 min. The optimum primary antibody dilutions used are described in Table 1. The slides were covered by 200 μl of diluted antibody overnight at 4°C in a humidified chamber. Slides were washed in PBS, incubated with biotinylated secondary antibody (K0690 LSAB+ Kit, Dako) for 45 min at room temperature. After 5 washes, 100 μl streptavidin-HRP complex (K0690 LSAB+ Kit, Dako) was added to each slide, and the slides were incubated for 1 h at 37°C. In addition, a substrate made fresh in the dark, by mixing equal volumes of 0.02% hydrogen peroxide and 0.6 mg DAB (3,3- diaminobenzidine tetrahydrochloride, Gibco BRL, code 15972-011), was added to the slides for 30 min at room temperature. The reaction was stopped by washing with tap water and the specific brown color was revealed after counterstaining with Harry's hematoxylin. An intense brownish deposit was considered positive. Omission of the primary antibody was used as a negative control for the different antibodies. For a MMP-9 positive control, a canine mammary carcinoma histological section was used. To perform in situ hybridization, the DNA probe was prepared from PCR amplicons of BoHV-5 DNA US9 gene according to the description in a previous study . After DNA purification from an agarose gel, the PCR product was linked into the TA vector (pGEMTEasy, Promega, Madison, WI, USA), and the ligation products were introduced into E. coli by heat shock. Positive colonies were confirmed by DNA sequencing. A confirmed positive colony was cultured, and its plasmid DNA was prepared using a commercially available kit (Promega Miniprep, Promega, Madison, WI, USA). The probe was generated by a PCR reaction targeting the gC gene located in the plasmid, as previously described, using a biotin-labeled reverse primer (Invitrogen™). Briefly, for the ISH assay, the slides from brain areas were submitted to the same protocol of de-waxing and re-hydration described earlier. The slides were then treated with proteinase K (10 μg/mL, Invitrogen™) for 10 min at room temperature and washed in PBS. A 259-bp denatured biotin-labeled probe was applied in a solution consisting of 2 μl (2 ng/ml) probe and 98 μl of pre-hybridization buffer (50% formamide, 5% bovine serum albumin, 1% N-lauroylsarcosine and 0.02% sodium dodecyl sulfate, Sigma-Aldrich®). Each slide was incubated overnight at 37°C under a plastic coverslip in a humidified chamber. The slides were then washed, and excess probe was removed by washing in increasingly stringent solutions consisting of 1 × SSC (saline sodium citrate) and 0.1 × SSC for 10 min at 42°C. To detect hybridization, 100 μl of StrepAvidin conjugated to peroxidase was applied to each slide, and the slides were incubated at 37°C for 1 h. The substrate as well as the procedures for counterstaining and slide mounting was the same as described for the IHC protocol. The following statistical analyses were performed: 1) chi-square for independence for cytoplasmatic and non-cytoplasmatic immunoreactivity of AOP-1, MMP-9, SNAP-25 and US9 BoHV-5 ISH stain scored on a four-point scale from no reactivity (1) mild reactivity (2), moderate reactivity (3) intense reactivity (4); 2) Mann-Whitney U test for immunohistochemical results and anatomical areas presenting microscopic lesions. The images were taken using a light Axio Imager A.1 microscope connected to an AxioCam MRc (Carl Zeiss Oberkochen, Germany). The micrographs were processed with Axiovision 4.7 software (Carl Zeiss). For each slide, at least 7 microscopic fields were randomly chosen, and the mean number of positive signals was calculated and computed as number of reactive cells/mm2. The SAS v 8.2 (SAS Institute Inc. Cary, NC, USA) and Origin software were used for data analysis. P < 0.005 was considered as statistically significant. All animal handling and sample collection procedures were performed in accordance with the recommendations of the Brazilian College on Animal Experimentation (COBEA), and all experiments were approved by Institution Ethics and Animal Welfare Committee. Brain lesions were mainly confined to the frontal cortex (Fc) and the parietal cortex (Pc) and were characterized as softening of parenchymal tissue and hemorrhagic foci in the Fc and Pc. The lesions were not symmetrical and lacked a well-defined pattern of distribution. No macroscopic lesions were seen in the CNS of the control group. In all cases, microscopic examination revealed histological changes of varying severity in several areas of the brain, but mostly in the Fc, Pc and thalamus. These changes were characterized by inflammatory cuffing, satellitosis, focal and diffuse gliosis and, rarely, inclusion bodies (Fig. 1B, C and 1D). An intense neuro-inflammation was described in all analyzed areas; however, it was almost exclusively seen in the Fc, Pc and thalamus (T) with a correlation coefficient of r = 0.8976. In most cases, the number of inflammatory cuffs was considered ≥ 70% and was considered statistically significant when compared to satellitosis (p = 0.0004). The likelihood ratio test yielded significant differences (p-value < 0.005) for gliosis, satellitosis and inflammatory cuffing between two groups (BoHV-5 infection versus healthy cattle). Inclusion bodies, however, were not frequently observed. The microscopic analysis performed in all cases provided confirmation that all animals were suffering from acute BoHV-5 encephalitis. In all negative samples studied, neither macroscopic nor microscopic alterations could be observed. Photomicrography of microscopic aspects of BoHV-5 infected calf brains. A) Inflammatory cuffs composed of mononuclear cells in the parenchyma and B) in the leptomeninges; C) areas presenting inclusion bodies infrequently detected, D) satellitosis and gliosis distributed in the parenchyma and close to neurons. Hematoxylin & Eosin stain; scale bar 50 μm. We observed a positive correlation (r = 0.8976) among AOP-1 (Fig. 2A), MMP-9 (Fig. 2B) and SNAP-25 (Fig. 2C) detected in all slides from the frontal cortex region. 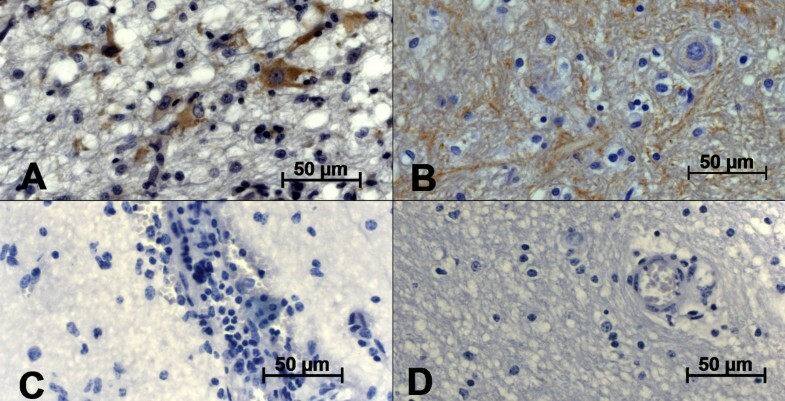 The AOP-1 staining was observed diffusely in the neuropil and in different types of brain cells, such as neurons, endothelial cells and glial cells (Fig. 3A-D). The MMP-9 staining was intensively visualized in the parenchyma and the cortical area of the Fc. Furthermore, the pattern of MMP-9 labeling was very similar to that of AOP-1 staining (Fig. 3A) and mostly visualized around neurons, endothelial cells, the subependymal zone and inflammatory cuffs (Fig. 4A-D). No unspecific label could be visualized in the control group. An intense change in SNAP-25 immune-labeling patterns was observed when comparing BoHV-5 and control cases (Fig 5A and B). The positive signals were mainly documented around neurons and microglial cells, and no signal was observed in the control group (Fig. 5C and 5D). Regarding to the US9 BoHV-5 gene in situ hybridization, positive cells were visualized mostly in Fc as shown in Fig 6A and 6B. Frequency of detection of antigens. 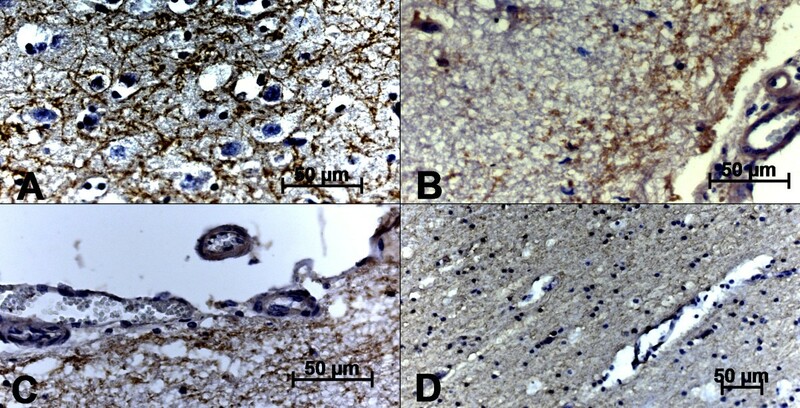 AOP-1 (A), MMP-9 (B) and SNAP-25 (C) proteins in different brain areas (Pc, Fc, T and M; x-axis) of naturally infected calves (n = 20) and a control group scored on a scale of 1 to 4. Photomicrography of immunohistochemical MMP-9 antigen detection in the frontal cortex of BoHV-5-infected calves (A-D). A) area of intense immunoreactions in the parenchyma; B-C) intense positive signals in the subependimal zones; D) no positive labeling was associated to control group. The strepavidin-biotin peroxidase complex method was used (scale bar 50 μm). 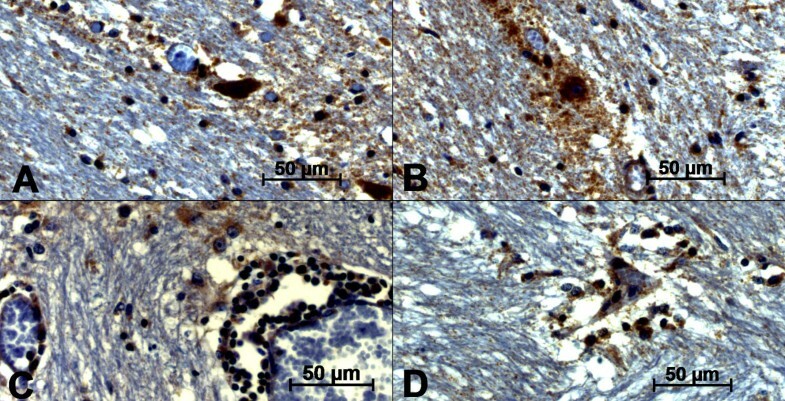 Photomicrography of immunohistochemical SNAP-25 antigen detection in the frontal cortex of BoHV-5-infected calves (A-B) and control group (C-D). A) positive immunolabeling of neuronal and glial cells; B) positive labeling dispersed in the parenchyma; C and D) no positive reaction in the control group. The strepavidin-biotin peroxidase complex method was used (scale bar 50 μm). Photomicrography of in situ hybridization assay. A) positive detection of US9 BoHV-5 gene in brain cells; B) positive reaction in neurons; C) positive reaction in glial cells; D) control group. The strepavidin-biotin peroxidase complex method was used (scale bars 20 and 50 μm). All animals included in the present study were field BoHV-5 cases selected by routine service in the Veterinary School, São Paulo State, Brazil. All symptoms were mainly described as loss of coordination and paralysis. Additionally, BoHV-5 infection was confirmed by virus isolation and molecular analysis [9, 15, 16]. The respective brain areas chosen in this investigation were based on positive results of in situ PCR amplification of the US9 gene of the BoHV-5 strain reported previously . Although the olfactory bulb has been described as the principal brain entrance for BoHV-5 infection, no immunoreactions were visualized for the AOP-1, MMP-9 and SNAP-25 proteins in this portion [15, 17]. As a consequence, only the frontal cortex, parietal cortex, thalamus and mesencephalon regions were considered for the analysis. Moreover, the use of natural cases of BoHV-5 infections is useful to address some questions on the cell signaling during immune response. Although experimental BoHV-5 infections of calves have been performed [1, 5, 10] the participation of oxidative stress, the integrity of the blood-brain barrier and synapses participation still need to be fully elucidated. One of the most distinctive viral encephalitis lesions, characterized as inflammatory cuffs, satellitosis and gliosis, demonstrated good correlation with BoHV-5 US9 gene hybridization [15, 17] Similar lesions have been previously demonstrated in acutely infected calves [3, 6, 10] and rabbits . The inclusion bodies were rarely noted. Although this result is in contrast with most reports describing cases of BoHV-5 inclusions [1, 8], one study has reported the absence of inclusions bodies in calves experimentally infected with BoHV-5 .. Supporting the premise that BoHV-5 entry into the CNS is facilitated by leukocytes, like for other herpesviruses, we also suspect that virus infections activate the AOP-1, MMP-9 and SNAP-25 proteins in the inflammatory infiltrates, which has been described recently as being composed by CD3 + T lymphocytes . Association between MMP-9 and herpesviruses has already been reported [11, 18, 19]. In vitro studies suggested that MMP-9 might contribute to Epstein-Barr virus (human herpesvirus type 4) spread , and the continued presence of HSV-1 as well as HSV-1 immune complexes is able to promote MMP-9 production . However, the association of MMP-9 with AOP-1 and SNAP-25 expression related to BoHV-5 neurological cases has never been described in association with herpesvirus infections. Living organisms produce reactive oxygen species during physiological processes and in response to external stimuli. To protect themselves against oxidative attacks as well as maintain a redox balance in their different subcellular compartments, cells have evolved complex mechanisms . These antioxidant defense systems include non-enzymatic substances, such as vitamin E, vitamin C, vitamin A and uric acid, and also enzymes with antioxidant properties, such as catalase, superoxide dismutase and glutathione peroxidase, as well as low-molecular-weight reducing agents, including glutathione and thioredoxin. A wide variety of stimuli, including tumor necrosis factors (TNF-α), phorbol ester, bacterial lipopolysaccharide and viral infection, can activate the cellular immune response . The antioxidant-like protein 1, (AOP-1, also called MER5, M.W. 25 kDa) a member of the family of proteins involved in defense against oxidative stress, seems to be involved in proliferation and differentiation, through anti-oxidant function and redox regulation . In this study, the AOP-1 positive reaction mainly around neurons suggested that this phenomenon is involved in the host-BoHV-5 interaction. Unfortunately, no information is available on anti-oxidative mechanism related to neurological disorders caused by virus infections. However, AOP-1 production has been described in ischemic disorders involving the CNS . Synaptic protein disorders have been related to clinical manifestations in a member of human and animal prionopathies . This phenomenon is not surprising since prion proteins are closely associated with synaptic machinery . In addition, SNAP-25 was intensively expressed, mainly in glial cells and neurons, in all the BoHV-5 cases studied. The biggest difference is the disease evolution; although prionopathies are characterized as degenerative disorders, the BoHV-5 cases studied here were classified as acute viral encephalitis . In summary, the neuro-pathogenesis studies carried out on filed cases of BoHV-5 infections suggest that cellular immune responses, particularly those involving blood-brain barrier integrity, oxidative stress and neurotransmission, are of great significance in meningoencepahalitis cases related to BoHV-5 infection. However, further studies must be carried out to determine the implications of these events for the different stages of BoHV-5 replication (primary infection, latency and viral reactivation) in neurological disorders. The data provide a basis for further study of the role of these proteins that underlie the pathologic process in BoHV-5 encephalitis. The project was supported by the Conselho Nacional Pesquisa (CNPq n° 472226/2007-0) and the Fundação Amparo à Pesquisa Estado de São Paulo (2008/03802-2). Tereza Cristina Cardoso is a recipient of CNPq council grants. TC, HFF, AFG and ALA carried out the practical work, performed necropsies, histological analysis and immunohistochemical assays. LCB and AHCN were mainly responsible for performing the statistical analysis. All authors read and approved the final manuscript.